The name of this art piece is 'Butterfly Beauty'. 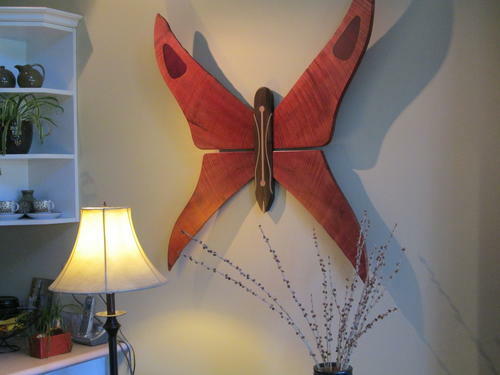 The wings are made from figured, live edge maple(reclaimed) and the body is walnut with maple inlay. The approx. size is 32" w x 34" h.
The artwork is beautifully spray finished with 3 coats of varnish to both protect and enhance the figured wood. Go to draftinghouses.ca for more photos, prices and more artwork. The name of this beautiful art piece is 'Sailboat Reflection'. The approx. 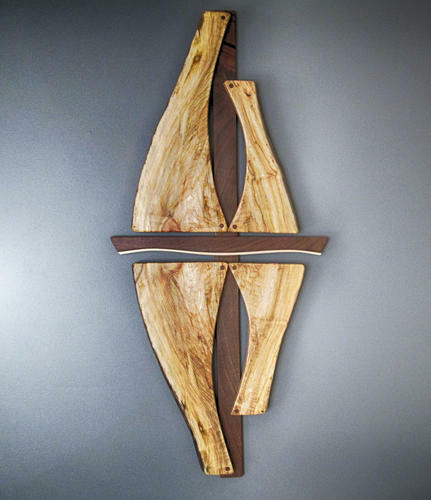 size is 21" w x 45" h. The sails are made from reclaimed spalted, live edge maple and the mast and boat is walnut. The artwork is beautifully finished with 3 coats of spray varnish to protect the art piece and to enhance the beauty in the wood. Go to draftinghouses.ca for more photos, prices and more artwork.